Big changes are on the way for a hospital in Boca Raton, thanks to millions of dollars of donations. On Tuesday morning, Boca Raton Regional Hospital unveiled the largest fundraising campaign in its 51 year history called "Keeping the Promise: The Campaign for Boca Raton Regional Hospital", totaling $250 million. 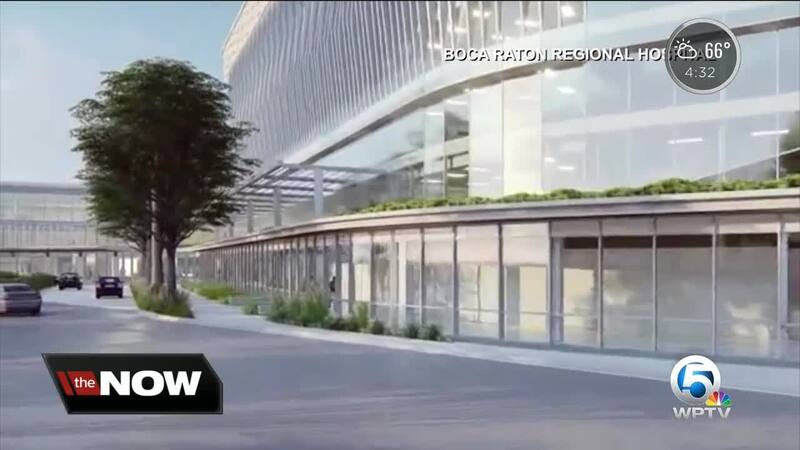 BOCA RATON, Fla. -- Big changes are on the way for a hospital in Boca Raton, thanks to millions of dollars of donations. On Tuesday morning, Boca Raton Regional Hospital unveiled the largest fundraising campaign in its 51-year history called "Keeping the Promise: The Campaign for Boca Raton Regional Hospital", totaling $250 million. The goal is to construct a new patient tower building and transform the hospital's campus. The multi-level project the campaign supports features several key components. First, a new 180,000 square-foot, seven-story patient tower will be the centerpiece of the new construction including an expansion of the surgical suites, an updated patient lobby, and three floors set aside for future growth. The Marcus Neuroscience Institute will make targeted staff and capital investments over the next five years in all neuroscience programs with an emphasis on neurovascular/stroke, CNS tumor, spine, and epilepsy/seizure disorders. In the current hospital building, all 400 rooms will be converted to private rooms through renovation, and a 20-bed observation unit will be added. A nearly 1,000 car parking garage will also be built. The total cost for all of these projects is $500 million. The hospital is already 40 percent of the way to its goal in the fundraising campaign, with $115 million raised so far. The fundraising effort is highlighted by eight-figure philanthropic gifts from five long-tenured members of the BRRH family, including Christine E. Lynn, Stanley and Marilyn Barry, Richard and Barbara Schmidt, Elaine J. Wold, and Louis B. and Anne W. Green. The projects will be completed in several phases, with the parking garage construction breaking ground in March 2019. It should be completed in a year. “We are extremely proud of this campaign, truly the most significant fundraising effort in our history, and so grateful to our family of donors who generously provided us with the foundation for the campaign’s ongoing success,” said Stanley L. Barry, Chairman of the BRRH Foundation and co-chairman of the campaign. “In our continuing commitment to serve the healthcare needs of Boca Raton and the surrounding communities, we sought to bring the philanthropic community together so we can effectively provide the next generation of healthcare in all key patient care areas." The next phase of projects, which includes the patient tower, won't begin until 2020. The final completion date for all of the projects is estimated to be around 2023 or 2024.